When black lava rock breaks down over time it creates black sand, and this has been the case at the beautiful Hana beach of Wainapanapa. Wainapanapa is also a park as well as a beach and there are miles of trails to wander. The Kings Highway which was purportedly built under the reign of King Piilanai many centuries ago actually ringed the entire island with a pathway and the remnants of part of this trail can easily be seen at Wainapanapa where the trail extends along the rocky coastline and comes upon an ancient Hieau, or Hawaiian temple which looks over the blue Pacific. In another part of the park there are a series of caves with water in them that provide for a fresh water dip. The beach itself is fairly small and on most days you will see more people simply walking on the beach so they can experience the black sand rather than see people actually in the water. A dip here can be refreshing however and the generally good clarity of the water makes it a location that can be good for an experienced snorkeler. As is the case with other Hana beaches this one can be dangerous so you should only go in when the conditions are safe regarding swimming as well as snorkeling. Facing to the North and East as it does, Wainapanapa can have its fair share of large waves that can easily get the best of you. There is a tendency for the waves to produce a shore break and as you maneuver yourself into the water you will often reach a sand and pummeled rock shelf that offers quite a drop. 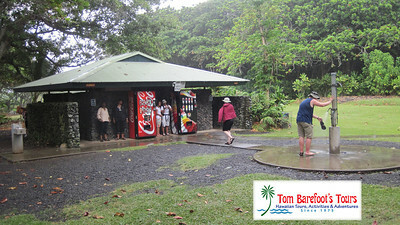 The park has great parking up above the beach and a full restroom for you to use as well as showers. Picnic benches are available with great views of the ocean and there are barbecue stations available. No lifeguards are assigned to this beach.